Lights, camera, action! Click here to play! 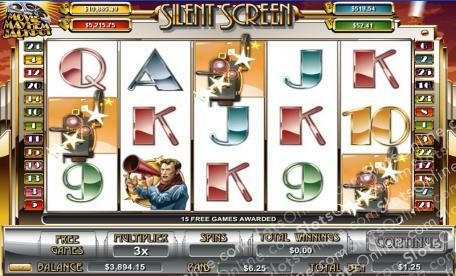 In the Silent Screen slots, you are a star or starlet from the Golden Age of Hollywood. Right now you are still small fry, without a contract at a big studio. A few movies in the right roles, and with the right co-stars should catapult you into the spotlight and along the red carpet, though. Legendary director Karl von Direktorburg has muttered that he wants you to play a major role in his next film. The scarf wearing director with the red loudspeaker has made most of the greatest movies of the decade, including 'Tonight, My Dear', 'A Tale of America in Wartime', and his masterwork 'The Fuzzlewuzzles Go To Fuzzlesnuzzletown, Part Deux'. His next film 'Au Revoir Chiens' could turn you into the star you've always known you deserve to be. Let the good time roll on the cameras and the reels as you play the Silent Screen slots. Outperform the other actors and actresses to get your close-up, and be sure to get involved in an action scene along the way. International audiences love an action star! The Camera symbol is the scatter in this game, and it pays out on the total bet when 2 or more land on the reels. It also triggers 15 free spins when 3 or more land on the reels, at a triple prize multiplier. The Actress symbol is wild and can substitute for any symbol other than the scatter.